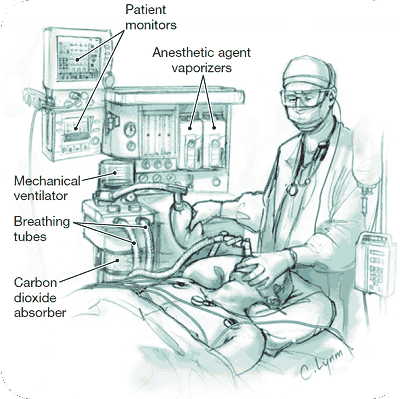 General anesthesia is unconsciousness produced by medications. This allows for surgery and other treatments that would otherwise be too painful or difficult to tolerate. During general anesthesia, a person is unconscious but is not in a natural state of sleep. At Hanover Hospital, anesthesia is provided by anesthesiologists (medical doctors with specialized education in the evaluation and care of patients before, during, and after surgery, including pain management), and by certified registered nurse anesthetists (nurses with additional education in the administration of anesthesia) who work with our anesthesiologists in an Anesthesia Care Team. Propofol, which produces unconsciousness (induction of general anesthesia). In smaller doses, it can be used to provide sedation (a comfortable state without unconsciousness). Benzodiazepines, which decrease anxiety right before surgery. Some medications that reduce anxiety may also help block memory of events. Narcotics, which prevent or treat pain. Volatile anesthetic agents are inhaled in a gas mixture containing oxygen. Sometimes, to avoid starting an intravenous (IV) line in infants and children, a volatile agent is given through a mask for induction of general anesthesia. Other medications include antiemetic agents (to protect against nausea and vomiting), muscle relaxants, medications to manage blood pressure or heart rate, and nonsteroidal anti-inflammatory drugs (NSAIDs). A common side effect of general anesthesia is nausea and vomiting after surgery. Some people may also have a sore throat and very occasionally damage to teeth, lips, gums, or vocal cords from insertion of breathing tubes and airway devices. Less common and more serious complications include malignant hyperthermia (a rare inherited muscle disease, which can be triggered by some anesthetic medications), heart attack, stroke, or death; these are more likely in patients who have heart problems, high blood pressure, diabetes, kidney disease, or lung diseases. Very rarely, persons may become aware of events when they are thought to be unconscious from general anesthesia; this is more likely during emergency surgery if the patient is in shock or during open heart surgery with the heart bypass machine. Follow the instructions given to you about what and when you may eat or drink before surgery. The Same Day Surgery unit will call the day before to verify instructions. Confirm which of your regular medications you should or should not take before surgery. If you smoke, try to stop for as long as possible before your surgery. Tell your anesthesiologist about all medications you take, including dietary supplements, herbal preparations, over-the-counter products, and illegal substances, because they can affect your vital signs and interfere with anesthesia medications. Ask questions of your anesthesiologist before the surgery so you know what to expect.